This is the Layers window. Here, you can see the list of layers that make up the image you are working on. Right-click the list to bring up the options for the layer. You can perform operations such as rearranging layers (which one is on top of which), hiding layers, locking them (a locked layer cannot be moved), etc. The layers windows supports drag-and-drop editing for rearranging layers. The layer menu can also be brought up by right-clicking the actual layer with the hand tool within the main window. When a layer has non-image data attached to it (known collectively as metadata or layer attachments), the layer will be shown with a paper-clip. Hovering the mouse pointer over the paper-clip will show the details of the metadata, including the four-letter codes used for identifying different kind of metadata (e.g. TEXT, PATH, etc.). Click the paper-clip for options. You can quickly hide and show layers by click the eye symbol on the Layers window. 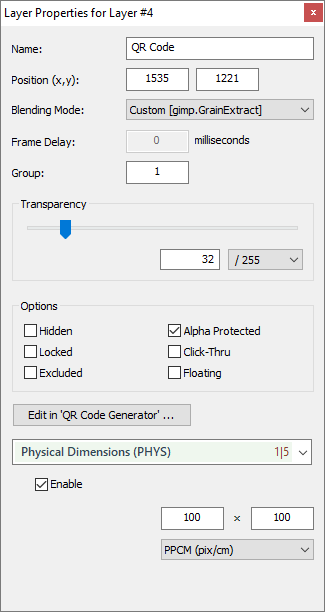 This is the Layer Properties window. It is displayed when you click the properties button on the Layers window and allows you to modify layer properties on the fly. See Introduction to Layers for more information.